Doug Deming, Dennis Gruenling and The Jewel Tones make a powerful and scintillating mix of jump, swing and Chicago blues. Each artist is accomplished in his own right. 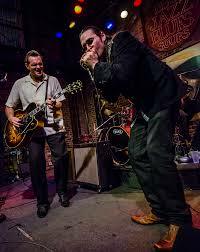 From Florida by way of Detroit, Doug Deming is the 2013 Blues Blast Music Award winner of the Sean Costello Rising Star Award and has backed artists including Kim Wilson, Lazy Lester and Alberta Adams. New Jersey’s Dennis Gruenling is a Hohner blues harmonica master class teacher and multiple award winner. He received the 2013 Best Harp Player Award from Blues411.com and Best Modern Blues Harmonica Player three years in a row from Real Blues Magazine. Together with the in-the-pocket rhythm section of The Jewel Tones they brew up heady and combustible music that is rich, soulful, swingin’ and amped up with meaty Chicago blues. And it’s music that is tremendously danceable. This band is a Hoodoo favorite who plays through the metro once a year or even less, so take advantage of two shows where you can check them out. See facebook.com/DennisGruenlingDougDeming and reverbnation.com/dougdemingdennisgruenling. Doug Deming & The Jewel Tones featuring Dennis Gruenling play a surprise FREE show at Barley’s at 114 W Broadway in old town Council Bluffs Friday, July 31, 9 p.m. The band also plugs in at Lincoln’s Zoo Bar Monday, Aug. 3, 7-10 p.m. Check this link and you can hear a full performance by the trio recorded in 2011 on NPR’s Mountain Stage. Also see the band’s site at redmolly.com. The Sunday Roadhouse offers a series of great Americana/roots shows over the coming months. The Suitcase Junkies play Aug. 15, Robbie Fulks and Redd Volkaert are set for Sept. 17, Malcolm Holcombe is back Oct. 4 and the great songwriter, guitarist and producer Gurf Morlix returns Oct. 18. See sundayroadhouse.com for details and venue information. I remember “back in the day” when I had to travel a lot more often to hear and see great live music, because options here were so slim for roots music. Now we are in the enviable position of having too many choices to keep track of at times. Stir Concert Cove hasn’t gotten a lot of ink from me this summer, but they have two notable roots shows this weekend. Hozier and Dawes both perform Friday, July 31, 8 p.m. The Alabama Shakes play Saturday, Aug. 1, 8 p.m. The Nebraska Folk & Roots Festival takes place Friday, July 31, and Saturday, Aug. 1, at Branched Oak Farm near Raymond, NE. Music happens on two stages along with kid-friendly activities. Local, regional and national artists perform including Amy LaVere, who has been seen locally at the Sunday Roadhouse. LaVere plays Saturday night, 7 p.m., followed by Motel Mirrors from Memphis at 10 p.m. Desert Noises (Provo, Utah), Joshua James (Lincoln/Salt Lake City), the Way Down Wanderers (Chicago), Old Salt Union (Bellville, Ill.), Victor & Penny (Kansas City, Mo. ), Union Specific (Austin, Texas), Violet & The Undercurrents (Columbia, Mo.) and more. Local acts include The Bottle Tops, Brad Hoshaw & The Seven Deadlies, All Young Girls Are Machine Guns, Lloyd McCarter & The Honky-Tonk Revival and Evan Bartels & The Stoney Lonesomes. See nebraskafolkandroots.com for admission details, directions and the complete schedule. There will be food and beverage vendors onsite. Music starts at 5 p.m. Friday night and noon on Saturday. If that isn’t up your alley, The Grassroots Music Festival also happens this weekend at Rivers Edge Park in Council Bluffs, along the Missouri River. Music from a variety of genres including rap, DJ and rock began at mid-day Friday, July 31 and continues through Sunday. The Saturday schedule is of the most interest to roots music fans with local bands and some big-name classic country, roots and rock acts. The Saturday line-up, in order, is: Jason Earl Band, Talbott Brothers, Michael Lee Firkins, Kris Lager Band, Blue Moon Ghetto, Atlanta Rhythm Section, Pure Prairie League, Marshall Tucker Band, Blue Oyster Cult, CCR and Lynyrd Skynard. Music starts at 11:30 a.m. Saturday. Lynyrd Skynard is the last band up at 9:30 p.m. Tickets are available via ticketmaster.com or at the gate. A Saturday-only pass is priced at $49.95 at grassrootstickets.com/downloads/august-1st-2015-one-day-pass. For general information see grassrootsmusicfest.com. He wasn’t a bluesman, but local musician Alan Mansfield was much loved in the local music community. Mansfield lost a long and fierce battle with cancer on July 30. There is a YouCaring fund to raise money for Mansfield’s final expenses, cremation and to help the family during this difficult time. See more information about Mansfield’s passing and the fund at youcaring.com/charyl-mansfield-403437#.Vbp3l6Rg. Trout, still down about 100 pounds in weight from his prime, pre-illness weight, according to Marie, performed a fiery set. A year ago, he said from the stage, he was too weak to even hold down the strings on his guitar. Now there is no he is back and he is performing better than ever. His music now benefits from the transformative experiences he had while waiting for a liver transplant and while recovering from his surgery. Tommy Castro & The Painkillers blazed through a great set also, and supported some special guests. Terry Quiett Band and Lauren Anderson Band also performed. For more information on organ donation visit donatelifenebraska.com. For more information on Walter Trout, his story and his new music see waltertrout.com. Brad Cordle Band plays Harney Street Tavern Friday, July 31, 9 p.m.
Scott Keeton Band plays Zoo Bar FAC 5-7 p.m. Friday, July 31, and also plays Saturday, Aug. 1, 6-9 p.m. Mark your calendars for The Derailers at the Zoo Aug. 11, 6-9 p.m.
Steve Byam’s 40SINNERS revs up his gutbucket, old-school blues next Thursday, Aug. 6, 9 p.m., at Harney Street Tavern. The 21st Saloon presents a special show Saturday, Aug. 1, with Too Slim & The Taildraggers, 6-9 p.m. The band is touring behind a new two-disc set, Anthology. Blues Bytes says. “Too Slim (Tim Langford) is not only a master of slide guitar, But he’s also a composer of the highest regard. A supremely talented performer and composer who ranks with the best that blues/rock has to offer.” See www.tooslim.org. Nashville-based Stacy Mitchhart, seen here previously at The 21st Saloon and on the Playing With Fire stage, is back with his guitar-fueled, high-energy stage show Thursday, Aug. 6, 6-9 p.m. See stacymitchhart.com.